"What's wrong with the world today? 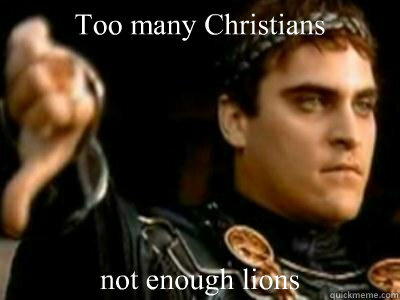 Too many Christians and not enough lions." You have probably heard this or variations of this statement from various atheists online. It is one of the many anti-theistic memes which seem to circulate constantly on social media. And if you have not encountered this particular meme, you have undoubtedly seen many others about which much of what I have to say here might apply. This particular meme about Christians and lions is not something I'd be inclined to promote. In fact, it strikes me as being counterproductive. But wait a minute! Don't those saying it have the right to do so? Absolutely, and I have no desire to take away their right to do so. When they say it, aren't they exercising their right to free expression? Yes, and they are certainly free to do this. But just because someone can say something does not mean they should say it. And just because I support the free expression of ideas does not mean that I must promote all ideas I encounter indiscriminately. In this particular case, I wouldn't promote the meme because it is not an accurate reflection of how I feel. I have no interest in seeing my entire family and almost all of my friends killed by lions. Not only do I have no interest in seeing it, but I would be extremely upset if it were to happen. And since I don't hate people merely for being Christian, I can easily extend this beyond family, friends, and acquaintances. There are plenty of good Christians who I would not like to have killed by lions. I do not characterize this particular meme as counterproductive merely because it is not an accurate reflection of how I feel about Christians. I'm not sure how its message is supposed to make anyone think or question their religious beliefs. The useful atheist and/or anti-theistic memes all seem to do this. They contain accurate statements and lead to deeper reflection in a way that this one doesn't. And there are many great ones out there that do this quite well. Does it bother me to see others spreading the meme above? It makes me wonder whether they mean it and hope that they do not. I find myself tempted to ask, "Are you saying you'd like to see people murdered for being Christian?" But of course, I know that the response I'd get at least 99% of the time would be one of claiming that it was intended to be funny. The fact that I don't find it funny isn't relevant here, but it does strike me as one of many examples of a counterproductive atheist meme. There are many ways one can try to promote atheism. Some are bound to be more effective than others. Determining which ones are effective and which ones are not is an empirical question we could answer with the right sort of data. Without such data, we have to make our best guess. Mine is that this particular meme is an example of a counterproductive approach to promoting atheism.